The Bay Area music community came together Friday night at the Regency Ballroom in San Francisco to remember and celebrate the late Ronnie Montrose, who passed away March 3 from a self-inflicted gunshot wound. “A Concert For Ronnie Montrose – A Celebration of His Life In Music” saw Sammy Hagar reunite the original Montrose band, plus Joe Satriani, to perform the group’s landmark 1973 debut album. 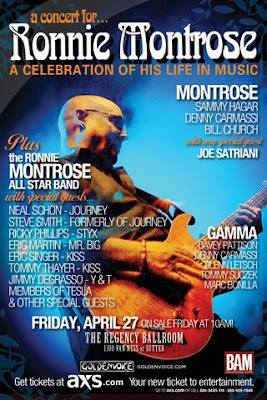 The event featured the original Montrose lineup (Sammy Hagar, vocals; Bill Church, bass; and Denny Carmassi, drums) joined by Satriani on guitar. The original Gamma lineup (Davey Pattison, vocals; Glenn Letsch, bass; Denny Carmassi, drums) also played, joined by special guest Marc Bonilla on lead guitar. There was also an All-Star band, comprised of many of the musicians that Ronnie played with over the years, including members of Journey, Tesla, Mr. Big, Styx and Kiss.